The current GRASS GIS version has partial support for Python 3. This project aims to update core GRASS components for Python 3 and update all the python modules, libraries and components like script package, python/ctypes, pygrass, temporal, wxGUI, etc. 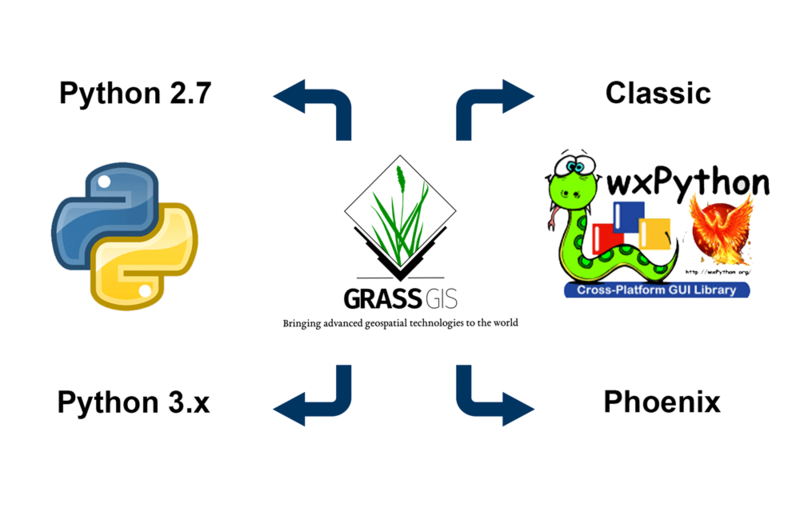 At the end of this project, GRASS GIS will be compatible with both the versions of python, i.e Python 2.7 and Python 3 with its GUI having support for wxPython 4. Dealing with Unicode & binary data (encoding and decoding). Finish pending work for this phase, if any. Writing additional classes in wrap.py for updating wxGUI to be compatible with both wxPython 3 and 4. I wrote an introductory email to the SoC mailing list and grass-dev mailing list and gave a description about my project and shared my wiki page, public repository, and project proposal links. I requested the write access to setup a project wiki page. Then, I created my wiki page detailing the project description, containing link to my GSoC application, a detailed timeline, link to my public repository where all my commits and progress can be followed. I have setup my code repository on github for tracking the applied changesets. I setup my development environment (Ubuntu 18.04) for two Python versions (Python 2.7.x and Python 3.6.x) for which I am using virtual environments. This was done because I need to make sure that when I update any code it should be compatible with both the versions. I added my project links to the OSGeo's Google Summer of Code 2018 Accepted students wiki page and trac wiki page: ​https://wiki.osgeo.org/wiki/Google_Summer_of_Code_2018_Accepted and ​https://trac.osgeo.org/grass/wiki/GSoC. I got in touch with my mentors to discuss the right approach to test the code and submit files. We discussed about the python libraries and their testsuites, starting with Python script library. I went through the GRASS wiki pages to get familiar with the working of the system (https://grass.osgeo.org/grass75/manuals/libpython/) and looked through the source code. Also, I found the code dependencies that I will be working with throughout the coding period. I wrote a bug fix related to wxPython(​https://trac.osgeo.org/grass/ticket/3510) during Pre-bonding period and submitted the patch file. Ctypes are not fully compatible with the Python3 even if they are compiling without any issues. Discussed with mentors about the next steps and how to deal with ctypes. Will discuss more about the upcoming milestones and how ctypes handling is to be done so as not to interfere too much with the pending work. This project updates the GRASS GIS software to support Python 3, where earlier it only worked with the Python 2.7 version. All the libraries, modules and components of the system have been updated to include the latest changes that have been introduced in Python 3. One of the important updates was a way to deal with unicode and bytes strings that helped in making GRASS compatible with both the versions of Python by properly encoding and decoding the strings. Additionally, the ctypes library, which was only working with Python 2.7, has been upgraded to deal with Python 3 which further helped in modifying the temporal and pygrass libraries. The pydispatch and guinittest modules have also been altered to properly deal with unicodes while the trunk/scripts have been modified and tested by writing new testsuites for them. The GUI module of GRASS is built with wxPython Classic version, which now with the help of wrapper classes works well with the latest wxPython 4 - Phoenix version. Before the start of the project, GRASS GIS had partial support for Python 3. The ctypes library failed to compile with Python 3 while a lot of code in other modules was also incompatible with Python 3 syntax. The GUI module worked with wxPython 3 (Classic version) but not with the latest wxPython 4 (Phoenix). There were a lot of assertion errors and deprecated code warnings that were seen when GRASS was coupled with the wxPython 4. After the GSoC, GRASS can now be compiled with Python 3 version. The different libraries and components of GRASS have been updated and are thus compilable with Python 3. The GUI module now has support for both the versions of wxPython, i.e. Classic (3 or older) and Phoenix (4). The biggest challenge in updating GRASS was dealing with the ‘ctypes’ library. The official library has not been updated since some time now and the Python 3 support is not complete. It was a major hurdle to get the 'ctypes' working in GRASS to compile other modules/libraries that are dependent on this library. After making the desired changes in the library, the GRASS system is able to compile but there are some lingering issues that make it hard to fix other errors that persist in the temporal and pygrass libraries. The next step would be to discuss ‘ctypes’ issue in further detail with mentors and the development community. Even though some issues related to ctypes have been solved in this project, it still requires some significant efforts and time to make it fully compatible with all Python versions. Moreover, fixing ctypes will help in solving all the remaining issues in other GRASS modules that are closely dependent on this library.